W&L Researchers See Coral Decline Geology professor Lisa Greer, who has been taking students to Belize since 2011 to monitor the health of coral reefs, said their research indicates that the latest El Niño, on top of global climate change, may be harming the Belize Barrier Reef. 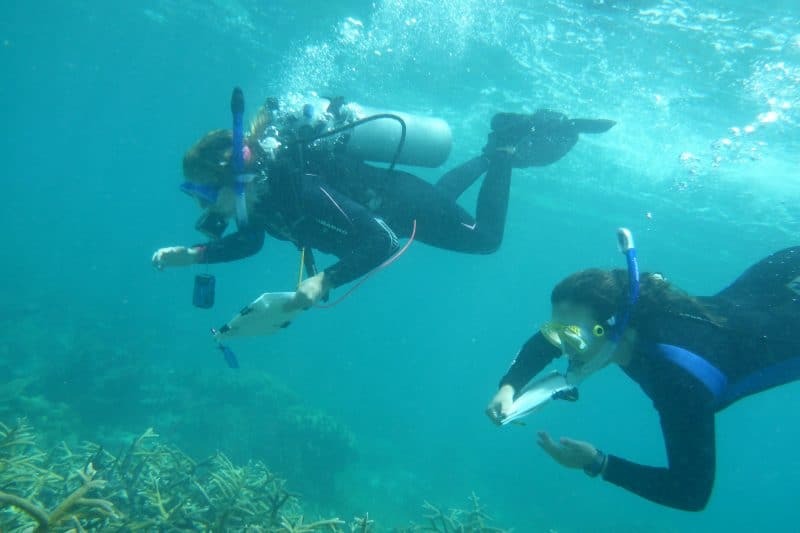 Mary Frances White and Lauren McManus study coral reefs in Belize. Beneath the jewel-toned waters off the coast of Belize — some 1,500 miles as the crow flies from Lexington, Virginia — Washington and Lee University researchers have eyes. Geology professor Lisa Greer, along with a number of student assistants, have been monitoring a section of the Belize Barrier Reef since 2011. They have placed devices in the Coral Gardens area of the reef that measure and record temperature, light and salinity at 15-minute intervals. Every summer, they have spent days meticulously photographing 133 separate, 1-meter squares of the reef with underwater cameras. Only in the past two years has this healthy, robust colony of staghorn coral begun to show the same signs of decline that have ravaged the species in other parts of the world. Although their data is not yet conclusive, Greer and her 2016 student researchers, Mary Frances White ’16 and Lauren McManus ’17, believe El Niño and global climate change could be to blame. White, a geology major and environmental studies minor, and McManus, who is majoring in geology and minoring in ecology, made two trips with Greer to Belize this year. In June, they spent six days gathering data along five transects of the reef that have been monitored year-after-year. This involves shooting pictures of the 1-meter square sections, then comparing them to photos taken in years past to determine how much of the coral has died. Scuba diving in Belize may not sound much like work to some, but the research dives are actually quite challenging. McManus and White first had to get SCUBA-certified, then they had to negotiate the water carefully to avoid touching and harming the coral. They dove for about six hours each day. In addition to photographing the reef in June, the team also gathered the devices that record conditions on the reef, then downloaded data from the computer chips in each data logger before returning them. In October, the trio returned to Belize for several days to re-photograph two transects and replace the old temperature loggers. White, who is doing her senior research project on the coral study, is still crunching and analyzing the data. But she, McManus and Greer said it’s pretty clear that something changed between the summer of 2014 and October 2016. It is quite possible that El Niño, the recurring climate pattern that disrupts temperature, winds and precipitation across the globe, is responsible for the change. The 2014—2016 El Niño event is one of the strongest on record. Most reef-building corals have a symbiotic relationship with an algae called zooxanthellae, which live in the coral. The corals provide a safe place for the algae to live, and the algae produce oxygen and help the coral to expel waste. When the water becomes too warm, the algae leave the coral tissue, causing the coral to eventually turn white. This is known as “bleaching,” which leaves coral more vulnerable to disease and potential death. According to Greer, since the 1980s, there has been up to a 98-percent mortality rate in Atlantic staghorn coral species. “They are kind of the poster child for the impacts of environmental change,” she said. The Great Barrier Reef in Australia has received a great deal of attention from scientists and the media because of its declining health, but the primary purpose of this research is to raise awareness of the wellbeing of the highly endangered reefs off Belize. “The goal is to contribute data that hopefully can eventually support conservation and preservation,” Greer said. The students who have assisted with the project since 2011 have played an important role in working toward that goal, she said, including White and McManus. McManus and White said they were honored to be involved in the project, and they hope their findings will have an impact on environmental policy.